OpenStack is the new ubiquitous open source cloud computing platform for private and public clouds. You can use ExpanDrive to connect to your object storage cloud powered by Rackspace and OpenStack. ExpanDrive gives you the opportunity to connect to your Rackspace files using a familiar file browser interface native to your OS. From the ExpanDrive window, click on Add. 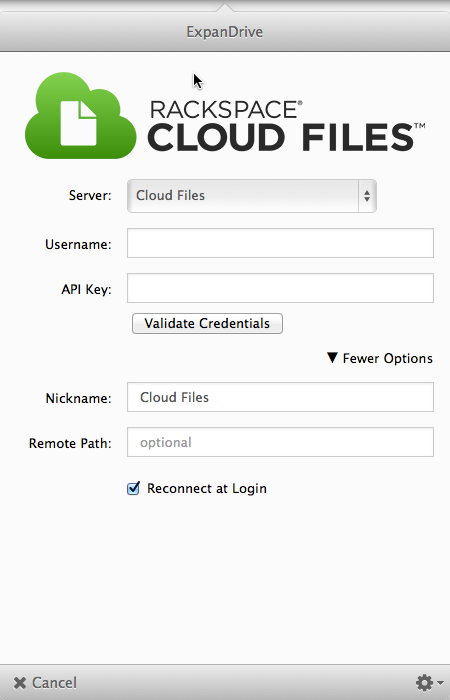 Click on Rackspace Cloud Files. The configuration screen is displayed. Configure the fields as described in the table below. Server Host name of your Rackspace cloud server. username The username supplied here is your common Rackspace Cloud username. api key Your API key is a unique alphanumeric identifier associated with your account and is used for universal authentication commands for all of your services. The key is your API access key. The key can be obtained from the Rackspace Cloud Control Panel in the <Your Account>/API Access section. nickname optional nickname to identify the connection. remote path An optional remote path that you specify, if you would like to map to a specific directory. drive letter Drive letter which expanDrive will map to your rackspace cloud files. ExpanDrive connects to the service, and the file browser interface native to your OS will open upon a successful connection.